A good night’s sleep plays a significant part in your general health and well being, your day-to-day energy, ability to concentrate and your mood. But, the quality of your sleep largely depends on the quality of your mattress. If your old mattress is not capable of providing you with the level of comfort and support you need to get enough of quality and sound sleep during the night, perhaps it is time for you to buy the new one. In today’s review, we’ll be comparing two highest-quality mattresses, the Brentwood Home Cedar and Spindle, both of which can certainly satisfy your needs and preferences. Both are all-natural mattresses, and while the Spindle is a 100% latex model, the Brentwood Home Cedar is a luxury latex and pocketed coil hybrid that Brentwood Home has recently released. The Brentwood Home Cedar is a 13″ latex and pocketed coil hybrid. It is a “green” mattress made up of all natural materials including natural latex, GOTS certified organic cotton fiber, organic coconut husks, New Zealand wool, and natural flax seed. 2″ Latex Layer – This layer is 2″ of natural Dunlop latex that provides pressure relief, comfort and responsiveness to the mattress, and combines with the grooved latex layer beneath for support and cooling. 2″ Latex Comfort Layer – This layer is 2″ of grooved Dunlop latex cut into 3 separate zones to provide comfort and support for the body and aid in ventilation and airflow for a cooler sleeping environment. 8″ Support Layer – This layer is 8″ of individually wrapped coils which provide the core mattress support and deep compression support for the body during sleep. Reinforced coils in the lumbar region provide support for the lower back, while edge retention coils provide appropriate edge support. 1″ Base Support Layer – This layer is 1″ of organic coconut husks which help with circulation and have anti-microbial properties. The Cedar mattress has an organic hand–tufted cotton cover that is naturally pesticide free, eco-friendly, and quilted with natural fire-retardant silica sand. It covers a layer of New Zealand wool that wicks away moisture, allows the circulation of air, and provides temperature regulation naturally via wool’s natural temperate regulating properties. In addition to this, the mattress has organic cotton tailored tweed sides, and custom handles. The Cedar mattress comes in only one firmness option, which is medium firm and it scores 6/7 out of 10, with 10 being the firmest. The micro coil construction and the latex in the top layers of this mattress provide more response and push-back than foam mattresses and give you the feeling of “floating on top of” the mattress, combined with the bouncier feeling of the supportive pocketed coil springs. With its 13″ design, the Cedar mattress provides an excellent support for sleepers of different weights in all sleeping positions. It has the firmness necessary for back and stomach sleeping and offers enough give in the top comfort layers to support shoulders and hips. It is a really supportive mattress and yet soft enough to be comfortable. The premium materials used in the construction of the Cedar mattress make it quite comfortable. The soft cover with the quilted layer of organic cotton and the latex and coil layers combine to provide a very comfortable sleeping surface and a nice degree of responsiveness and bounce. The Cedar mattress does a good job at sleeping cool due to its specific construction. You will not get the sticky sweaty feeling that some mattresses cause as the natural materials and micro coil system used in the construction of this mattress allow excellent airflow and prevent the build-up of heat. There is a minimal degree of sinkage with this mattress and a decent amount of motion transfer due to its coil and latex design, but this again largely depends on the weight of the sleepers. Edge support in this mattress is good, as the edges do not compress when sitting or lying near them and there is no feeling of “rolling off” the edge. Its 13″ thick construction prevents the heavier sleepers like Andrew to sink to the foundation when sitting on the edge. As for the motion transfer, the bouncy latex and coil construction of the Cedar causes some motion transfer when sleeping and changing positions during the night. The Cedar mattress gets high marks in this category for not releasing any noticeable smell upon opening the box. This has to do with the natural materials included in its construction which do not contain chemicals or petroleum by-products that usually produce the smell. The Cedar mattress is a little bit pricey coming in at $1795 for a Queen (save 15% by clicking here and entering code MFT15). But, this is a good value given the quality materials used in the construction of this bed. Click here to read the full Brentwood Home Cedar mattress review. The Spindle is made of 100% natural Dunlop latex which can be customized to suit your needs and sleep preferences based on your questionnaire answers. It is unique in that the company sends it as a customized parcel of three latex layers, which you can assemble at home according to your liking. If it happens that the combination of the latex layers you have received does not suit your needs, Spindle offers the option to swap out the layers until you finally find those that will be perfect for you. We have tested the Spindle mattress in the “Firm“ setting. It is 10“ thick and made up of 3 layers of natural Dunlop latex. The cover of the Spindle mattress is made up of circular knit fabric with 1″ of natural wool batting. The Spindle mattress arrives in different boxes and is designed to be assembled at home. The cover is unfolded and then 3 boxes of the 3″ latex are laid out and placed within the cover depending on the firmness options selected and then zipped up. As it has been already mentioned, the Spindle mattress comes in a variety of firmness configurations. Based on the weight of my partner Andrew (230lbs), the company recommended that we go with the Firm model. The Firm setting has a Medium firm layer on top and two layers of firmer latex below, and we rate it around a 7-8 out of 10 on the firmness scale (10 being the firmest). What is great about this mattress is that it feels more comfortable than many foam or spring mattresses of the same level of firmness due to its latex nature. As such, it provides excellent support for all sleeping positions and does a great job at supporting Andrew’s heavier weight. It offers enough give in the top comfort layers to support our shoulders and hips while also having the firmness necessary if we switch to our stomachs and backs. Although the Spindle mattress initially feels rather firm and not as cushioned as some of the memory foam mattresses, with the time it adapts to your body and provides a nice body contouring and a very comfortable night sleep. The responsiveness and bounce coming from its quality latex construction do not just provide a comfortable sleeping surface, but they can also enhance the romantic moments with your partner as well. The Spindle mattress, like the Brentwood Home Cedar, does an excellent job at sleeping cool. Latex doesn’t retain heat like foam does, so it eliminates the sticky, sweaty feeling typical for memory foam mattresses and provides a comfortable and cool sleeping surface. There is not much sinkage and motion transfer with the Spindle, especially with the Firm setting as the latex used in its construction, ensures there is minimal sinkage when sitting or lying on the mattress. Edge support is very good with this mattress too. The edges don’t compress when sitting or lying near them, and they will not cause you to feel as if you are going to roll off your bed. Although the Spindle is a bouncy and responsive full latex mattress, it causes minimal motion transfer as the high-density latex layers and firmness of the mattress all work together to isolate movement to a good degree. The Spindle does not have any off-gassing and any significant odor due to its all natural latex design. Although we did have the latex smell on our hands after assembling the mattress, the mattress itself did not have any significant odor. Although the Spindle is priced lower than the Brentwood Home Oceano, it is still more expensive than most mattresses we have tested as it is 100% latex. It comes in at $1349 for a Queen, but you can save 5% on this price using code: talk5. Click here to read the full Spindle mattress review. Below is our comprehensive side-by-side comparison of the Brentwood Home Cedar vs. Spindle mattress. Which Mattress Is Right for You? Eco-friendly materials – The Cedar mattress is a green mattress incorporating natural materials such as natural latex, coconut husks, natural flaxseed, organic cotton, and New Zealand Wool. It is one of the most natural mattresses you’ll find online, made without pesticides, toxins and harmful chemicals. Pressure relief – This mattress offers excellent pressure relief due to the zoned support in the 2″ latex comfort layer. Comfort and bounce – The soft cover with the quilted layer of organic cotton and the latex and coil layers combine to provide a very comfortable sleeping surface and a nice degree of responsiveness and bounce. 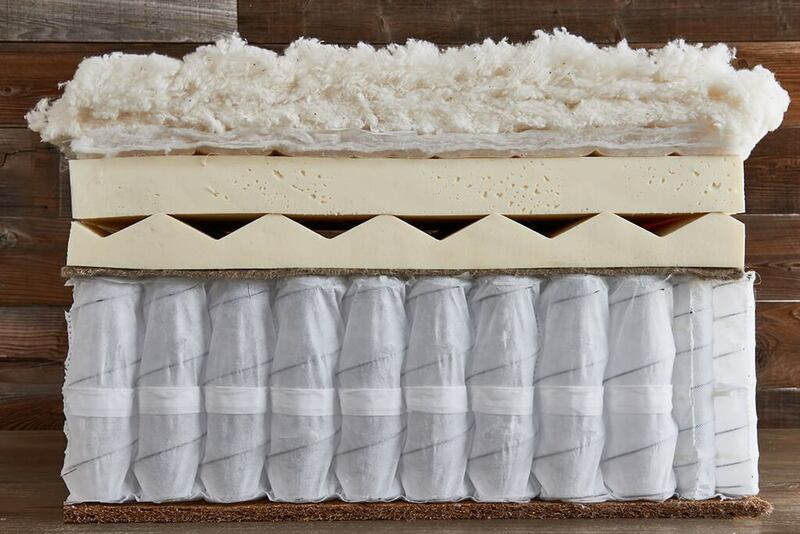 Natural materials – From the all-natural latex used in the construction of the Spindle mattress to the organic cotton and wool batting in its cover, it is an all-natural, eco-friendly mattress. It is an excellent choice for all eco-conscious individuals. A Mattress With a Lot of Bounce – The Spindle is a very bouncy mattress thanks to its all-latex construction. So if you opt for a mattress with a buoyant structure that will provide you with the feeling of sleeping on top of the mattress rather than sleeping in the mattress, then the Spindle would be a fantastic pick for you. A Cool-Sleeping Mattress – The combination of wool that wicks away moisture and serves as a natural temperature regulator and all-natural latex in this mattress will prevent the build-up of heat and provide you with a cool and comfortable sleep. Our Top 10 Mattress Picks! How To Put on a Duvet Cover? How To Remove Dog Hair from Blankets? How To Wash Tempur Pedic Pillows? How To Wash Polyester Pillows? Copyright Memory Foam Talk 2019. All Rights Reserved.